The traditional uses of this great herbal smoke are more extensive than virtually every other herb we offer. It's rich and varied history in ritual spans the globe. In Pre-Columbian times the Aztecs used mugwort as a ritual incense. Mythologically speaking, Mugwort is dedicated to Artemis and Diana, and was well known for it's use in helping to alleviate pain in the body, while enhancing psychic powers and lucid dreaming in the mind. 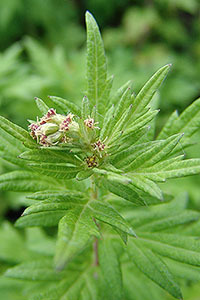 In Korea, mugwort is said to have different medicinal properties depending on the season. In some areas, the plant is so strongly psychoactive that individuals gathering the plant have passed out just from dermal contact with the plant leaves. Mugwort is often used to ward off evil spirits in spiritual rituals. The Ainu tribe of Japan drink a tea made of mugwort before beginning divination in order to expel evil influences. It is also used as an incense by Nepalese and Indian shamans, who say that it wards of demons and other evil spirits. What we find most intriguing is that Mugwort was called the "Sailor's Tobacco" as Mugwort not only had a very tangible effect from smoking it, but it was used as a tobacco substitute when tobacco could not be found. We agree that this is a great base for any smoking blend, and it's no doubt that's why SweetSmoke Herbs has decided to use it as the basis of their flagship LUCID HERBAL SMOKING BLEND. Read in-depth details about Traditional Uses, Traditional Preparation and more at Mugwort at Entheology.com.